“Aisu” is a three part conceptual book series. Issue 1 is inspired by the 2001 Nintendo GameCube System. The themes of this issue form on understanding memory through digital mediums of photography and web design. Issue 2 is based on the sublime. It has no cover or spine design. The full scale images are from the original sourced articles while the smaller images are related images found via Google. Issue 3 is inspired by the graffiti artist who passed away on 55 South. The text explore the blatant deception in seemingly linear existence. Collaborative cookbook with food photographer Aqeela Khan. “Beloved” is comprised of photographic portraits of stuffed animals that were acquired from friends, family, and other anonymous individuals. Each animal displays its former handling, showing a trace of melancholy despite its child-like charm. The book is in large format, offering a bodily interaction that contrasts with the small plastic, glass, and metal devices that demand our attention as adults. Concept poster for an exhibition featuring photo and fashion collaborators Paul Jung and Melitta Baumeister using only typography. 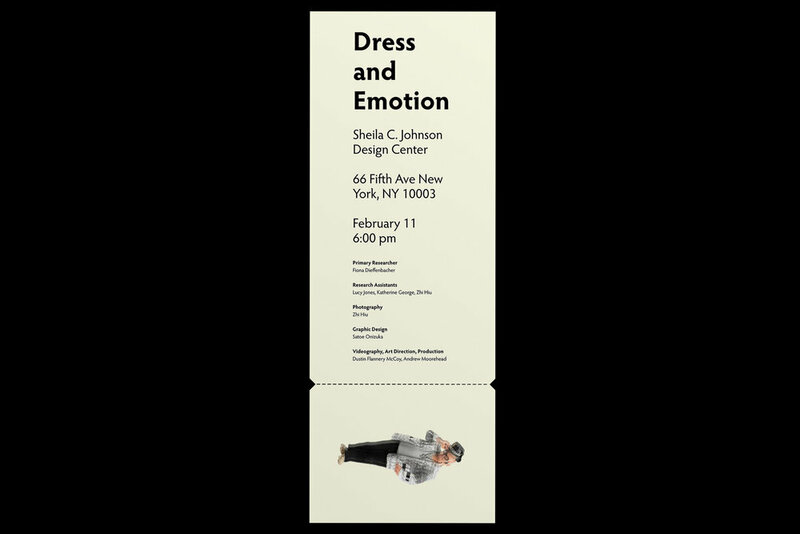 Invitation that acts also as a ticket into the “Dress and Emotion” exhibition held at the Sheila C. Johnson Design Center. The exhibition was about fashion and self expression in every day New Yorkers.